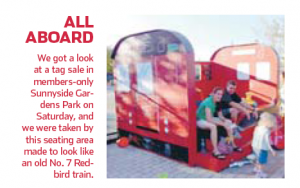 amNewYork ran a photo in today’s newspaper (Play section, page 9) of a seating area shaped like a redbird subway car. The interesting lawn furniture is located in Sunnyside Gardens park. This entry was posted on Monday, September 27th, 2010 at 3:52 pm	and is filed under subway. You can follow any responses to this entry through the RSS 2.0 feed. You can leave a response, or trackback from your own site. Midge, thank you very much for finding my blog and replying to my post. From the photo, it looks very nice. I’d love to check it out in person some day.